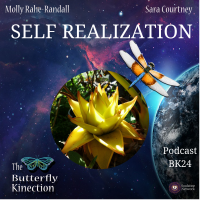 Molly and Sara discuss the profound effect self realization can have in our soul growth, with our relationships with others, and in how we honor ourselves. After we begin to tell ourselves the truth, we begin to have realizations about who we are and how we conduct ourselves around other people. Self realization is accepting the truth and being ready to realize what is needed next in order to move forward without fear. 2:22-Sara shares a story involving her grandmother who has passed. We often have trouble moving forward even after having self realizations due to fear of the unknown or because of the depth of pain we might be feeling. We might find it hard to tell the truth about how we are feeling to others. Self realization is a gift because it’s the point where we can spark movement by believing in ourselves and setting the intention to change. 9:45- Molly shares her realizations about her daughters’ birth and gives deep insight into her relationships with others. Some realizations may require us to re-evaluate the relationships in our lives. We may need to create bigger boundaries with others or even let certain relationships go that no longer serve us. Molly and Sara talk about many ways in which we must be able to make ourselves a priority. Our mindset is so much more powerful and positive when we are taking care of ourselves and filling up our cup. Part of self realization is being positive minded and deciding to make the changes we want to make. Manifest and believe change will happen even if we don’t know what the outcome will be.